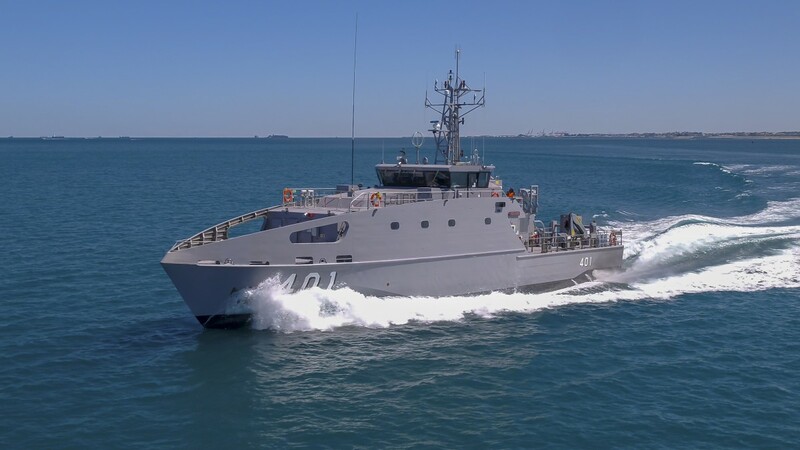 AUSTAL (ASX: ASB) today delivered the first Guardian Class Patrol Boat (GCPB) to the Australian Department of Defence and then in a handover ceremony, presented the vessel to the Papua New Guinea (PNG) Government. The “Ted Diro” is the first of 21 GCPBs to be gifted to 12 Pacific Island Nations and Timor-Leste under the Commonwealths Pacific Maritime Security Program. “Austal are proud to deliver this program for the Commonwealth of Australia. The Guardian Class has brought together the industry-leading skills of over 200 Austal employees, and estimated to have employed an additional 200 people indirectly through the design, construction and sustainment process. The Guardian Class is the latest evolution of Austal’s proven patrol boat platform that was first introduced some 20 years ago, commencing with the Bay Class Patrol Boat developed for the Australian Customs Service. Since 1998, Austal has delivered 32 patrol boats to the Commonwealth – representing Australia’s entire border patrol capability. Indeed Austal has delivered or has orders for a total of 97 patrol boats for Australia and around the world. Over the past six weeks, we have had the Ted Diro crew from the PNG Navy at Austal training on how to use and maintain the new vessels. Their positive feedback on the greater capability, amenity and operability of the Guardian Class has been fantastic. We look forward to show casing the new vessels to the other Pacific Island nations over the life of the 21vessel program through to 2023”. Austal CEO, David Singleton said. “The program is now in a full rate of production, with the second vessel, which is destined for Tuvalu, successfully launched on Monday with an additional three vessels in various stages of construction. Austal are already looking at export opportunities for the GCPB” Mr Singleton said. The Pacific Patrol Boat contract was awarded to Austal in May 2016 with a contract option in April 2018 taking the program to 21 vessels valued at AU$335 million. The program supports more than 200 direct jobs at Austal and more than a further 200 indirect jobs through the Australian industry involved in the program. Austal has around 1000 employees in Australia directly contributing to delivering a strong domestic and export shipbuilding industry. The Guardian Class Patrol Boat was designed and constructed by Austal Australia for the Commonwealth of Australia's Pacific Patrol Boat Replacement Project, comprising 21 vessels to be delivered to 12 Pacific Island nations and Timor Leste. Image: Austal. Minister for Defence Industry The Hon Steven Ciobo MP hands over the first Guardian Class Patrol Boat 'Ted Diro' to the Papua New Guinea Defence Minister The Hon Solan Mirisim at a ceremony held at Austal's shipyard in Henderson, Western Australia. Austal CEO David Singleton welcomed dignitaries including Australia's Defence Industry Minister, The Hon Steven Ciobo MP, Senator The Hon Linda Reynolds and WA Minister for Tourism, Racing and Gaming, Small Business, Defence Issues, Citizenship and Multicultural Interests The Hon Paul Papalia MLA, Chief of Australian Defence Force General Angus Campbell, Papua New Guinea Minister for Defence Solan Mirisim, Commander of Papua New Guinea Defence Force Major General Gilbert Toropo and Papua New Guinea Defence Secretary Mr Trevor Meauri to the Guardian Class Patrol Boat Delivery Ceremony on 30 November 2018. Photo: Austal.